Although I had a commitment at work until early afternoon, this was a day when I knew I could chase after about 1:30 and had been hoping some chase weather would occur. I was not disappointed. This would, in fact, turn out to be a very enjoyable, though non-supercell/non-tornado, chase day, a day in which I would see and videotape what may have been the most spectacular gust front/shelf cloud I have ever seen. A low pressure center was near the Iowa-Illinois border with a warm front across northern IL and a cold front trailing across Missouri. Heavy storms overnight had caused widespread flooding in eastern Iowa and northern Illinois, and had laid down an outflow boundary across central IL. A sharp temperature gradient existed across the front, with temperatures in the 60s north of it and the low 90s south of it. With CAPE in the warm sector over IL in the 2000-3000 range and good forcing along the front, it looked like decent potential for severe wx, even though directional shear was not all that great. Either the front, the outflow boundary, or both could be the source of storm development. Already, storng storms were developing in scattered areas extending from southwest of Chicago through the Galesburg area and into far NE MO. This mesoscale discussion issued by SPC not too long after I got home was all I needed to get me headed to central IL. I figured I would go up I-55 to Lincoln then go on into either the Peoria or Bloomington areas, depending on the situation by the time I got to Lincoln. 2:20 - Out the door. I head north on I-55, as planned. 2:40- I decide to give Chris Novy a call for an update. I have gotten a couple TOR warnings over the ILCHASE pager, but the message is incomplete so I don't know where they are. Chris informs me that they are for northern IL, with all of the strong storms still north of PIA, though the outflow boundary has now surged S of that area. He says it appears that most of the storms are along the front rather than the outflow boundary. He also says to expect big things, since he is not able to chase today. 3:20 - The pager goes off again - new TOR warning after a tornado is reported by spotters near Streator. Cool, except for the fact that I am about 120 miles too far south. 3:30 - A good sign -the first vortex of the day! I observe a large (for Illinois) dust devil in a field south of SPI. 4:10 - I catch up to the outflow boundary near McClean, and watch a large dust cloud surge south with the boundary. (NOTE: this and all other pictures here are video captures - due to the breakage of my snapshot camera a couple days before this chase.) When I first saw this I thought it was smoke and snickered about not being fooled by a "smokenado," but I soon realized that it was not smoke but dust being kicked up high in the air by the roughly 40 mph winds along the outflow boundary. I had been watching some towers go up along this boundary, and some did develop to the point of producing thunderstorms, but these raced off to the east. I was left under rather high-based TCU with a kind of an elevated shelf cloud-like feature directly above the wind shift line. However, it became clear by around 4:20 that this feature was moving out far ahead of the main cluster of storms, which was reinforced when I heard this SVR warning for Peoria, Knox, and Fulton Counties. I had been planning to try a data stop at the Dixie truck stop across I-55 from the frontage road when I finished watching the dust cloud, but this warning sent me on my merry way north. 4:25 - Nearing Bloomington, I plan to go north on I-39 to El Paso to get east of the storm. I figure I can intercept it in that area or head west toward Eureka for an intercept. I am determined not to repeat the mistake I made in NE Madison County last month of letting a storm get ahead of me, when I missed a possible tornado as a result of that miscalculation. 4:50 - I exit I-39 at El Paso, take a quick potty break, then head west on U.S. route 24. In a few minutes, a severe thunderstorm watch is issued for most of central and SW IL and eastern MO. 5:10 - A SVR warning issued for Tazewell Co., just to the W and SW of my location, as I head W toward Eureka. In the distance, I see a multi-tiered shelf cloud, as well as lightning - both well to the west on other side of Eureka. 5:20 - I am through Eureka and headed wouth toward I-74 on IL route 117. 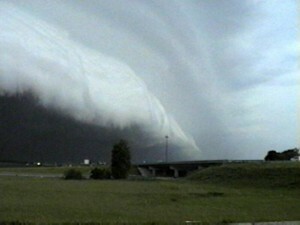 I watch a spectacular shelf cloud approaching from the west toward my location between Eureka and I-74. Wind damage is occurring in Washington, Tremont, and Metamora around this time, and a bit earlier, the storm has dropped 2-inch hail just west of Peoria. 5:25 - I hear a SVR warning for Woodford Co., where I'm located. I know I will have to immediately duck SE when I reach I-70, or I will be swamped by the storm. 5:30 - I jump on I-74 to bail SE just as the leading edge of the shelf sweeps over. Instantly, day turns to night. I am blasted by gusts I would estimate at around st 50 mph and horizontal rain. It is so dark that I can't even see for sure which lane an approaching car is in as I enter the freeway. Obviously, conditons are much worse to the W. A lot of people are pulling over to wait out the storm, but since I am right on the leading edge I figure I can blast SE and get ahead of it. This not as easy as I think. The chaser now has become the chased. Blasting SE at 75, I can barely outrun the storm. After a few minutes I do get just ahead of the leading edge of the shelf, but it is hot on my tail. 5:35 - I hear a new SVR warning for McClean Co., which I am entering from Woodford Co.
5:45 - I stop to film the shelf cloud just W of Bloomington on 74. Spectacular! Around this time, the storm produces wind damage in Makinaw and .88" hail just S. of El Paso. I see a huge, wide dust plume most of the way up to the cloud base under shelf cloud to SSW. It looks like something you would see in Oklahoma or Colorado, not Illinois! A bit closer to me, the shelf cloud showed a sharp linear striation where it intersected with the parent cloud. I get a little more video of the spectacular, menacing shelf cloud as the storm is about to overrun me again. Time to bail again and try to get south around the storm at Bloomington. This severe weather statement elaborates on what was occuring at this time. 5:55 - It is quickly evident that getting around the storm is not going to happen. Heading south on I-55 and 74, I get blasted by dust kicked up by wind I'd estimate at 40-50 mph. I see several small dust swirls in the outflow; too small to really call gustnadoes. Near Funks Grove, I exit the freeway to let the storm pass over, which it quickly does. Although this statement indicates parts of the storm are still severe, there clearly not as much punch in the storm here as there was farther north. 6:40 - I've cleared the storm and am working south toward home. But I hear a new SVR warning for Sangamon Co., which I am approaching from the north. 6:50 - Now I see the strong storm ahead, so I exit at Elkhart. I briefly watch a rainbow to my east, then see an odd cloud feature under the updraft of the storm to my SW. It is pretty solid and looks a little like a wall cloud, but it is not attached, and never becomes attached, to the parent cloud above. The part closest to the core is cumuloform and boils up toward the updraft base above, while the part farther away is more stratiform looking. It develops a small inflow band on the side toward the storm, as CG intermittently zaps down in the nearby core. It also seems to gradually widen with time. Occasionally what appears to be hail shafts can be seen in the core near this feature. Here is a picture of this feature. 6:55 - I am gradually poking W and N to avoid the storm, which unlike the earlier one is drifting slowly NE. I see what appears to be rather pronounced hail shafts around 7 p.m. This would be near SE corner of Menard Co., near Logan/Sangamon lines. Here is a video capture of the hail shafts, along with a very close CG that gave me a bit of a startle. 7:10 - Working way back to I-55, I see the storm has weakened as it moves NE into Logan Co. The odd cloud that had formed under the updraft is left alone as the updraft fizzles, and the cloud evolves into a wide stratus cloud well to the NW of the area of dying thunderstorms. Soon I hear that the SVR warning has been cancelled. 8:15 - Heading home on I-55, I have been watching 3 new towers aligned N-S to the west of I-55 in Macoupin and N. Madison Counties. I decide to exit at Livingston to watch these new storms. CG zaps down close by as the middle storm backbuilds and the south two cells merge. I watch this storm pulse up, as the lighting increases to about 1 per second as the storm is NW of Worden, from which location I watch it around or just after sunset. I finally call the chase due to darkness around 8:45. 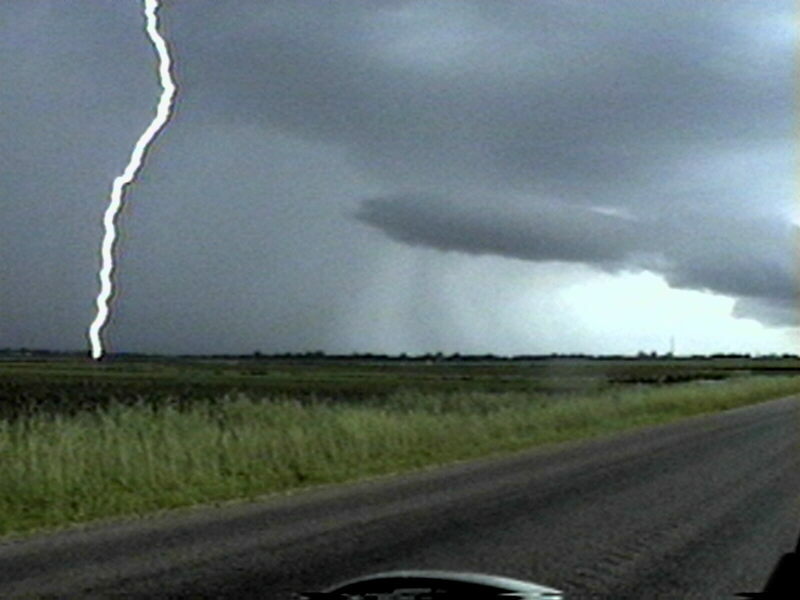 Local storm reports on the central Illinois storms can be found here. Here is a radar image from 5:00 p.m. as the storm is going severe west of Peoria. A few minutes after this, 2-inch hail was reported near Bartonville, just W of Peoria. Here is a radar image from 6:00 p.m. By now, the line has surged dramatically east and SE, with the most severe part of the storm near the northern end of the bow echo, near El Paso, where .88 inch hail was reported about the time of this radar image. Total chase distance: 357 miles.